Here in Ohio we are expecting some freezing rain so Ms Lori brought us home some soup from one of her favorite lunch places City Lites in downtown Dayton. This great dinning place is inside the Schuster Center. Oh ya back to what we had. Cream of asparagus soup and a salad with a chicken breast was what we had. Let me tell ya for as much as I like Uno’s cheddar broccoli soup this is really close to being better. I got out a spatula to clean out the pan we reheated the soup in. This Tator gives the soup 4 spuds lol. This entry was tagged 365, city Lites, fun, kid friendly, laugh, Mr. 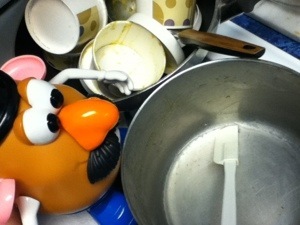 Potato Head, muse, picture a day, soup. Bookmark the permalink.